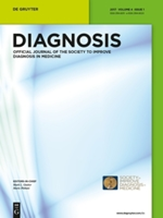 Diagnosis is the official peer-reviewed journal of the Society to Improve Diagnosis in Medicine (SIDM). Published by De Gruyter, Diagnosis focuses on how diagnosis can be advanced, how it is taught, and how and why it can fail, leading to diagnostic errors. The journal welcomes both fundamental and applied works, improvement initiatives, opinions, and debates to encourage new thinking on improving this critical aspect of healthcare quality. SIDM has made this possible because Diagnosis shares our goal of encouraging new thinking on improving this critical aspect of healthcare quality by highlighting both fundamental and applied research, improvement initiatives, opinions, and debates. Members of the SIDM community have been involved with the journal since it was first published in 2014. SIDM founder and president Mark L. Graber, MD, FACP, also serves as its co-editor-in-chief, with Professor Mario Plebani of the University of Padua, Italy. All of the associate editors are also SIDM members: Nicolas Argy, Paul Epner, Giuseppe Lippi, Kathryn McDonald, and Hardeep Singh. SIDM members receive free access to Diagnosis. Already a member? Log in to your account and read every article published in Diagnosis. Not a SIDM member? Join today to receive free access to Diagnosis. Or continue as a guest with limited access to read select free articles published in each issue or purchase issues.